Following our series on the Lost Banknotes of the EU, I wanted to look next at the 12th country to join the EU back in 1981: Greece. Twenty years after joining the European Union Greece adopted the euro and phased out the Greek drachma. Because there are some discussion about Greece and the euro, I don’t want to focus on any of the economical controversy or prior inflation; I only want to look at the series of drachma and the influence of the banknotes in Greek culture and history. After gaining independence from the Ottoman Empire in the late 1820’s Greece originally issued their currency, called “phoenix”. While these first issues are plainer banknotes, they are very rare. It is believed that the term for this new currency arises from the classic image of a phoenix rising from the ashes (which was depicted on their coins) and commemorates the kingdom’s new-found freedom, under their President John Capodistras. However this phoenix monetary system only lasted 5 years, and in 1831 (the same year as the assassination of Capodistras) the phoenix was replaced with the Greek drachma. Greece came under the rule of King Otto in 1832 and he quickly set to establish a National Bank for Greece. The bank that was created became the sole institution for issuing banknotes in Greece for 87 years. A popular face to the Greek drachma is Georgios Stavros (whom you can see above on the 1926 note). During this development period Stavros became a key figure in the establishment of the National Bank and was the first governor, elected in 1842 and remaining in this position for almost 30 years until his death. 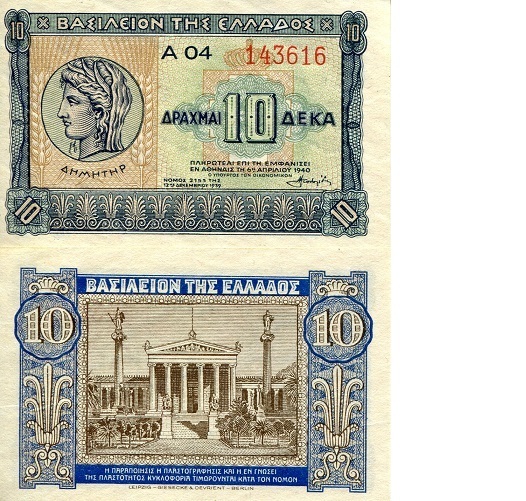 Stavros image is depicted on over 40 Greek banknotes. After 1932 a new issue of drachma were released that no longer featured Stavros’ portrait. This new series instead depicted different images of Greek culture, history, and modern life. The below example is from a 1987 issued banknote and features Apollo. You can also see pictures of ancient coins as well as on the reverse side a Discus Thrower. In the background you see the ruins of Hera temple at Olympia. The featured depictions on Greek banknotes are so widely ranged, some include images of: Poseidon, Aristotle, Athena, Chariot races, The Parthenon, plus so many more significant Greek figures and places. One of my favorite Greek notes we have on our website is the below banknote from 1935. Unfortunately the notes we have available are in a lower grade due to the age of them, however you can see the beautiful colors and images. This note, as well as two other Greek notes were actually printed in France, and I think you can see some of the French style in this Greek drachma. With so much cultural and historical significance, I find these Greek banknotes to be severely important to their heritage. Every time I get to look at old drachma I am reminded of the Greek story and what an amazing part of history they represent. I hope you also enjoy getting to look at some of these beautiful banknotes and see them as we do, a window into the world in which they represent. You can always see more Greek notes on our website, here! And as always, thank you for stopping by!